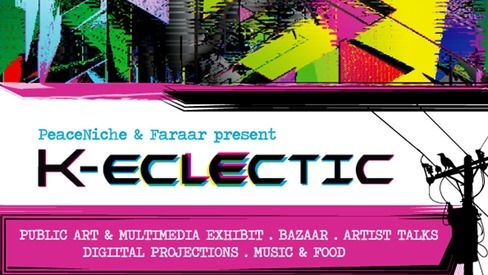 When was the last time that the people of Karachi got together to promote art, listen to a talk about the city's culture and tap their feet to blues beats from the '60s and '70s? Held at The Second Floor (T2F) yesterday evening, K-Eclectic packed a punch for all those who attended. 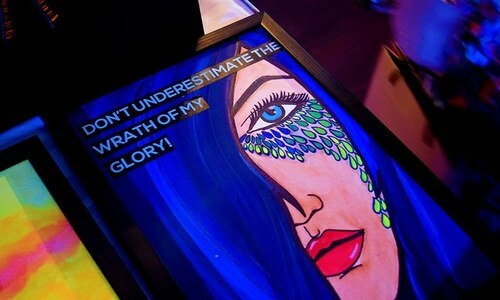 A witty pun on the forever faithless K-Electric, K-Eclectic brought together young artists to showcase their work at the Faraar Gallery, which has been re-launched to not only sustain T2F but to also provide a place to exhibit creativity. "While the K obviously stands for Karachi here, 'eclectic' was chosen to represent the diversity in the city," explained architect/T2F devotee Marvi Mazhar who was looking after the event. "The organisation does need support and Faraar Gallery will help in that aspect as well, but more than that, we want young artists to become viable. Instead of limiting their work to their teachers, artists who are in the varsities are welcome to sell their art pieces." She added that they also aim to build profiles for artists, so buyers will not only know their names but will also remember their alma matter as well as their niche. With The Beatles playing loudly in the background and visitors coming in to explore the small area dedicated to Faraar Gallery, one could strongly sense the spirit of Sabeen Mahmud, who had named the gallery because she wanted the art to escape to everyone. 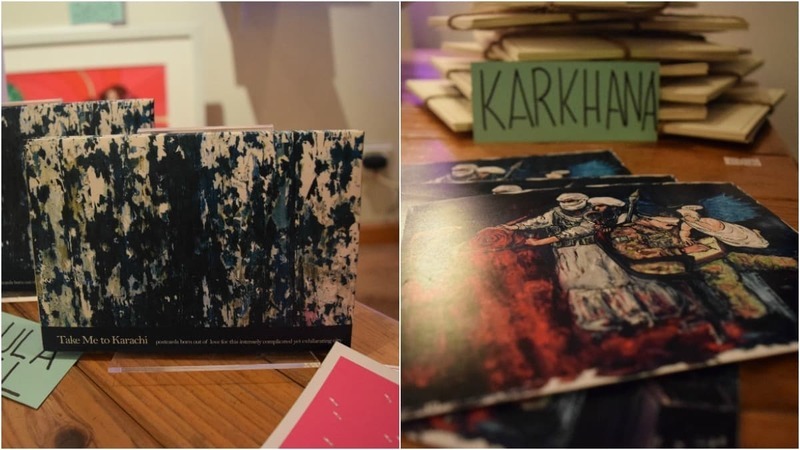 Varying from Marilyn Monroe desi postcards to art pieces about rebellious daughters refusing to get married, artists like Sumaiya Jillani, Sara Nasir, Samya Arif among others had put forward their exclusive pieces. Although some may dub them pricey, the hard work that goes behind in creating every piece can never be equated with the cost which is for a better cause. While people browsed through Khaula Jamil's Karachi-centric postcards, Sumaiya Jillani's artwork portraying the changing narrative of the armed forces sold like hot cakes. A pop-up cafe offering biscuits, brownies and chola chaat was set up at an ideal location, as the bookshelves were right across the cart as visitors bought books as cheap Rs25 while munching on their favourite treats. The book shelves are now a permanent feature. A talk titled 'Karachi and its changing culture' was also hosted with distinguished speakers; namely, former education minister Hamida Khuhro, journalist Akhtar Baloch and writer Asif Farrukhi. What many expected to be a boring history lesson turned out as an evening of laughter as Akhtar Baloch and Asif Farrukhi held the floor by sharing anecdotes about the city's degeneration. Mr Farrukhi wished that being a fiction writer myths about the city, whether they’re about Kalachi Jo Kun’s crocodile hunter or Alexander should be explored instead of solely representing the place as a ‘hell city’. Baloch also discussed other tales from Shah Abdul Latif Bhittai’s works about formation of a shrine for a woman who served wine and how once a cobra was found in the drinks to which Farrukhi responded that wine servers and shrines exist separately now but the cobra too lives with them. Although many think that in Karachi, streets have no names, it’s fascinating to see the transformation of names in lieu of who possessed the city. Farrukhi said that in an attempt to convert all to one dominant religion, streets and road were converted too. “But no matter how hard it is tried, some roads and landmarks retain their old names — Bunder Road is yet to become MA Jinnah Road,” quipped Baloch. Farrukhi also stressed over the expansion of the city at the cost of its heritage that there is no practicality when it comes to building huge flyovers and underpasses with some of them becoming a nightmare. All three speakers believed that instead of averting gaze from the rich history, it is high time to embrace it. “Instead of being embarrassed and hiding away from the diverse, pluralistic history, we need to accept it and take pride in it,” said Farrukhi. He wrapped the talk by reciting poet Afzaal Ahmad Syed's popular poem 'Hamain Bohat Saray Phool Chahyen''. The performance by In Time band featuring Norman D'Souza, Cliffy Lucas and Gerard Vanderlowen however was the highlight of the event as two members of the band who played at Beach Luxury Hotel during the 1960s, took all the attendees to the time when music was in inherent part of the city. Hitting it live with Louis Armstrong's 'What a Wonderful World', the band moved to 'Mrs. Robinson' by Simon & Garfunkel and dedicated it to Sabeen's memory. Wilson Pickett's 'Mustang Sally' got people on their feet as few shook a leg to the song with others cheering loudly. October Cherries' 'Beautiful Sunday' resonated with the crowd as the band members made sure that they responded to the beats. Creedence Clearwater's 'Have You Ever Seen the Rain' brought on an air of nostalgia as some attendees who weren't from generation X and Y could actually relate to it. Businesses are closing down due to increased power theft. And K-Electric is trying to portray themselves as a cool and hip company. The city and businesses are on fire while they are playing a flute. Yes the earlier comment was showing the flip side of K-eclectic. @aslam shaikh I don't know what this small gathering have to do with business . But if you or anyone like you really sincere , so they must concern about population and thousand of marriage halls where people spending millions to have more population. @aslam shaikh Agree, but don't you think it's a good step under such circumstances when your city is like a ghost house? Atleast they have a courage to step forward..